Five miles from Lake Erie's shores sits the historic Ohio community of Kirtland, a small town of about 7,000 devoted to preserving its natural resources. That dedication to nature preservation is most evident at Holden Arboretum, a tree preserve and garden spanning 3,600 acres, 20 miles of hiking trails, 25 lakes and ponds, and more than 12,000 plantings of trees, shrubs and perennial plants. Founded in 1931, Holden Arboretum welcomes about 80,000 visitors every year from outdoor enthusiasts, backyard gardeners and other plantlovers, many looking for information about new and unusual tree and plant varieties. "People are curious - what is that? What color blooms does it have? How big will it get?" says Greg Wright, Holden Arboretum's nursery supervisor. "It's of great value to them." Holden Arboretum satisfies that visitor curiosity by using Metalphoto signs to identify each tree, shrub or plant with its common name, Latin name, height, origin and other descriptors. The signs are part of Metalphoto of Cincinnati's Sign-num Sign System, the first landscape signage system that provides permanent environmental resistance. This system utilizes a durable ABS plastic frame to secure the Metalphoto anodized aluminum sign in the soil. Metalphoto provides easy readability with high-contrast white-onblack graphics, and is built to withstand extreme heat, humidity, UV, exposure to chemicals and more. Metalphoto is proven to maintain its original appearance for more than 20 years. "(MPC has) always been very helpful and accommodating." Over the last 20 years, Holden Arboretum has installed thousands of Metalphoto signs to identify its tree, shrub and plant species. These signs can be found throughout the preserve's 3,600 acres, including in popular spots like the Butterfly Garden and the Rhododendron Garden. 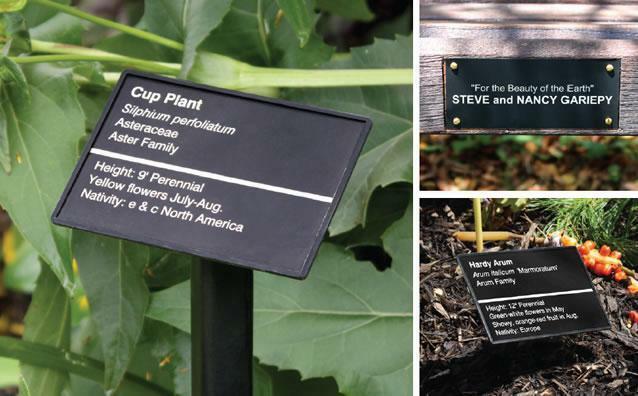 Every year, Wright orders about 600 more Metalphoto signs to identify new plantings. "They've held up well," says Wright, adding that his biggest challenge is keeping the signs clear of bird droppings. With so many plant species to track and identify, Metalphoto of Cincinnati has become a trusted partner to Holden Arboretum to create accurate and timely signage. Wright says Holden Arboretum had tried in the past to produce their own signs from engraved plastic, but was disappointed in the appearance and durability. Engraved plastic signs are prone to UV fade and do not offer the longevity of Metalphoto. "We always have a consistent product from MPC." Today, Wright manages an intricate database to track information on each plant, and provides exported data to MPC to generate signage. "They've always been very helpful and accommodating," says Wright. "The turn-around is usually about two to three weeks." By offering durable, readable and long-lasting signs, Metalphoto of Cincinnati is helping Holden Arboretum achieve its mission of preserving its land, trees, plants and wildlife for the future. "We always have a consistent product from MPC," Wright says. MPC has the experience to deliver a quality product exactly to customer expectations and specifications.